Like the perfect genie, the Siri intelligent personal assistant, included with the newest iPod touch, responds to your command and tries to understand your requests. You can ask for directions, look up contacts, search the Internet, schedule appointments, look up baseball scores, and take dictation with apps that offer Siri in the online keyboard, such as Notes. To turn Siri on or off, choose Settings→General→Siri from the iPod touch home screen, and tap the on/off switch on the Siri settings screen. You can also tell Siri who you are by tapping My Info and then choosing your name in the Contacts app. Siri not only uses your current location but also uses your contact information (such as your home and work addresses, phone numbers, and e-mail accounts) to fulfill your requests, such as “Show me how to get home from here.” You must be connected to the Internet over Wi-Fi for Siri to work. 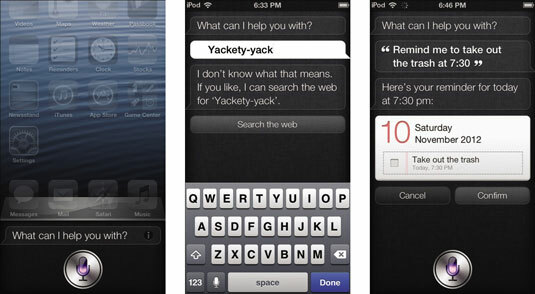 Siri learns your speech patterns and phrases over time as long as you leave Siri on. If you turn Siri off, it forgets everything and resets itself. To activate Siri, press the physical Home button until the Siri microphone appears. (If you change your mind, you can cancel Siri by pressing the Home button again.) You can start speaking right away — the microphone glows in color from the bottom indicating that Siri can hear you. Siri waits for you to stop talking before it digests what you said, or you can stop the conversation by tapping the microphone. You can also restart the conversation or reply to Siri by tapping the microphone. When you stop, Siri displays what it heard and provides a response. You can scroll up to see the entire conversation. If Siri doesn’t understand what you said, it presents the Search the web button, which you can tap to automatically launch Safari and search the web. You can also tap your request to edit it. If Siri understands your request (such as “Remind me to take out the trash at seven-thirty”), it displays the response with a Confirm or Cancel button to confirm the action with the app. You can tap Confirm or say “Yes” to confirm the action. There are many useful actions you can perform with Siri, such as making a FaceTime call to a friend in your Contacts app, using Message to send a message telling a friend you’re on your way, setting up a meeting in Calendars, tweet your location, and post your Facebook status.